Today Mitsubishi Heavy Industries, Ltd. (MHI) and Mitsubishi Aircraft Corporation jointly released their latest status report concerning progress in developing the MRJ (Mitsubishi Regional Jet), their next-generation regional jet. Simultaneously they also reported on the current state of preparations for expanding production bases towards inauguration of the new aircraft’s manufacture. Details are outlined below. Going forward, progress will be periodically disclosed. 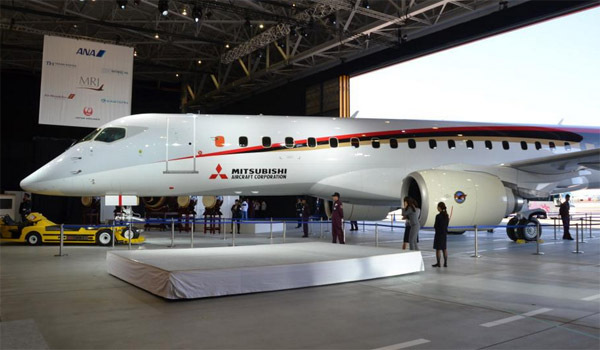 Effective April 1 MHI and Mitsubishi Aircraft launched a new management structure to facilitate transition of the MRJ project from the development stage to the manufacturing phase, and under the new framework initiatives are moving forward towards more unified operations. Prior to inauguration of the new structure, in January Mitsubishi Aircraft relocated its complete Head Office functions to the Nagoya Airport Terminal Building (Toyoyama-cho, Aichi Prefecture) next to where the MRJ’s final assembly, ground testing and flight test are performed. Relocation to this site has resulted in a highly efficient business operating structure. Presently static strength testing and manufacture of the second and subsequent flight test aircraft are all proceeding smoothly. In order to fully incorporate the verification results of the various ground tests and related feedback into the first flight test aircraft, the timing of the first flight has been reviewed and is now scheduled for September or October of this year. Going forward, MHI and Mitsubishi Aircraft will implement intensive flight test after the first flight and accelerate manufacture of the aircraft towards first delivery, as scheduled, during the second quarter of 2017. Along with all other procedures, we will seamlessly proceed with the preparation of a high-level customer support system. The comprehensive production base expansion scheme that was announced by MHI in February 2014 has been finalized as detailed below, aiming at full utilization of MHI’s production facilities for manufacture of the MRJ. 1) The new plant being constructed on a site previously owned by Aichi Prefecture adjacent to Nagoya Airport will perform final assembly, outfitting and painting to bring the new airplane to completion. 2) MHI’s Kobe Shipyard & Machinery Works will integrally produce parts for wings, which will be brought to the Nagoya Aerospace Systems Works’ Tobishima Plant (Ama District, Aichi Prefecture) for fabrication on dedicated assembly lines being newly constructed. 3) In tandem with these initiatives, a production collaboration association to produce aircraft parts will be established, and a cluster is in the process of being formed at the Matsusaka Plant in Mie Prefecture, to undertake integrated production of parts for commercial aircraft in a collaborative manner. 4) Mitsubishi Heavy Industries Aero Engines, Ltd. in Komaki, Aichi Prefecture, a group company of MHI, will perform final assembly of the MRJ’s engines. 5) To control and manage the physical distribution of the vast number of items involved, a real-time network linking all production facilities in Japan and worldwide suppliers will be established. 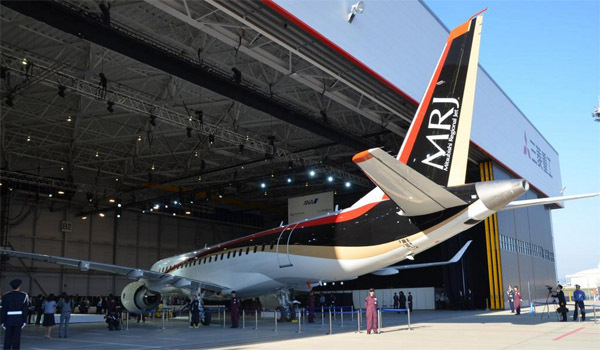 The MRJ is a family of 70- to 90-seat next-generation regional jets under development by Mitsubishi Aircraft. The MRJ will offer substantially higher fuel efficiency combined with reductions in noise and emissions, and also provide spacious cabin comfort on a level unprecedented in regional jets to date. Orders have already been received for 407 units of the MRJ (223 firm), and the MRJ’s rollout ceremony was held last October. Going forward, MHI and Mitsubishi Aircraft will continue devoting their collective resources towards the successful completion of the MRJ project as a significant contribution to the development of the aviation industry.